1. Review the Giving Guidelines to determine if your organization and proposed project/program fits within the focus of The Elsa M. Heisel Sule Foundation. 2. Before Accessing the Online Grant System, please review the applicant tutorial. The application process begins with creating an account for your non-profit 501(c) organization through our online software program. 3. Create your Account, you will then be directed to submit a “Letter of Intent”(LOI) in this same online grants management system. There are four grant cycles per year. However, LOI can be submitted at any time. Their date of remittance will determine in which grant cycle the request is placed. 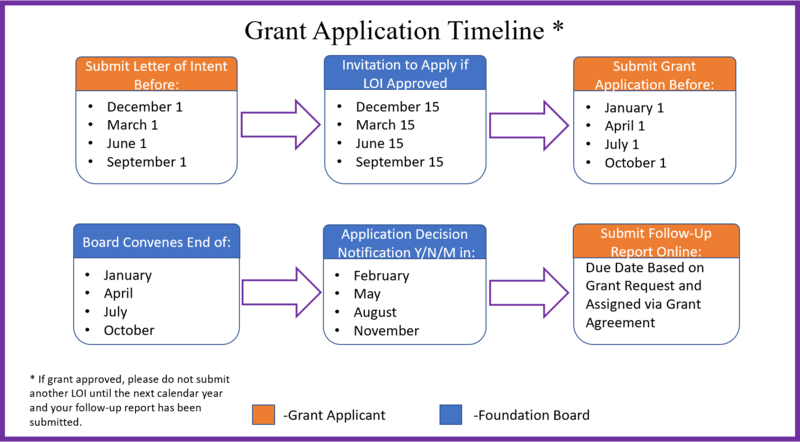 See the grant application timeline below for date guidelines. Please create only one account for your organization. If your organization has an account, please use the login credential already established. If you need assistance please contact the Elsa Heisel Sule Foundation via email or phone. 4. The Foundation LOI Committee will review the LOI’s, and within approximately a week after the submission deadline they will reach a decision (see the grant timeline below). The Foundation will communicate by email the decision of the committee to the grant applicant. If the LOI is approved, the applicant will proceed to the formal Grant Application using the same login and password created to submit the LOI. 5. Grant Application Submission must be submitted by the respective grant application date to be considered for the specific cycle. The application is reviewed by the Trustee, Staff and Board of Advisors. Site visits may be scheduled and conducted to meet with the nonprofits Executive Director, Program Officer, Board Member and any other persons essential to the program or project contained in the grant application. At the site visit, the Elsa Sule representatives may have additional questions or requests for information as well as observe the operations of the nonprofit and it’s proposed program/project. In some cases, we may request the nonprofits permission to electronically document media presentations on site for use at the the Elsa Sule Foundation board meeting. 6. The applicant will be notified of the decision of the Board of Advisors within a few days of the board meeting. If the grant request is approved, a grant agreement will be drafted to be signed by the applicant’s appropriate members. 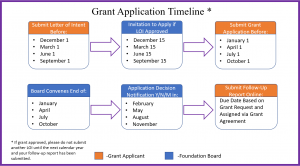 Each applicant that receives a grant must submit a follow-up evaluation typically six to twelve months after the initial grant was made or at the conclusion of program/project. The follow up report will be sent out via our online grants management software system after your signed grant agreement is returned. You will fill out and return the follow up report via the online system. An interim report must be submitted if the program/project is not completed within one year.